Really, really exhausted from today’s work. It’s routine, yup, but the lethal combination of arduous journeys, winding roads, the torturous climate, and the incessant waiting rendered us almost incapacitated for the hours spent down south. It’s been some time since I’ve been ranting, so let me be …… or else. OK, I digressed. Sue me. Hahaha …. I’m certainly in a sarcastic mood today. And thankfully it’s raining as of now, hence all sins washed away !!! Thanks be to the ones above …… or something. 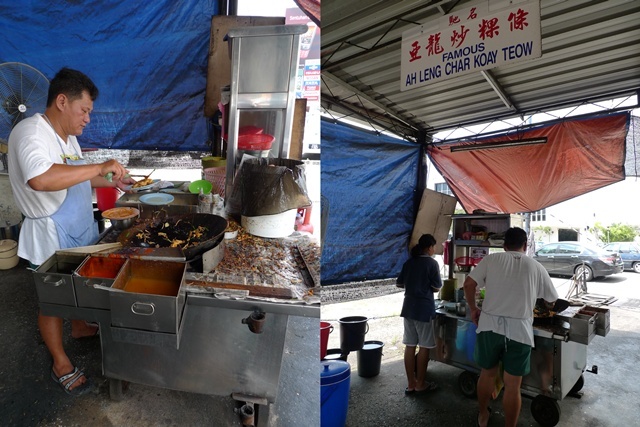 Thanks to CK, Ken and Lingzie, I got very, very specific directions to this famous CKT stall situated along Jalan Dato Keramat in Georgetown, Penang. Normally, we just whizzed past this shop without even noticing its existence! Yup, all 4 years of my life spent in Penang, and not even on one solitary occasion we noticed this place. Kinda pathetic eh? Or put it simply, I was merely too careful when I was driving, to be distracted with sights and sounds, or glancing around; 360 degrees. Hehehe … yeah right. 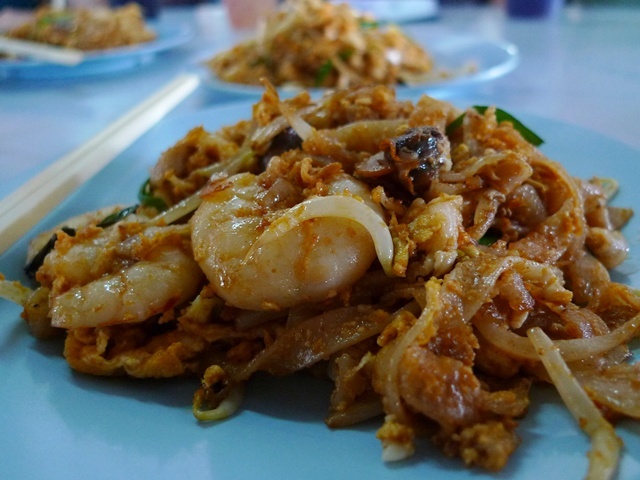 A plate of Ah Leng’s SPECIAL Char Koay Teow (more prawns, and addition of mantis prawns!) @ RM9.00, additional RM0.50 if duck eggs are used. So, this unassuming coffee shop, or “cafe” (very loosely used term here) named Kafe Khoon Hiang houses only 2 stalls. Or 3, but I can’t be bothered to remember as of now. There’s an economy rice stall, and Ah Leng CKT stall, which is opened from morning til afternoon only. Seems like they closes on Thursdays (info from PenangTuaPui’s site). Ah Leng’s version is brimming with ingredients, from the usual suspects (prawns – REAL plump ones, cockles, and egg -chicken’s/duck’s, chives and bean sprouts) to the rather unusual (but most welcomed, of course!) mantis prawns (lai liu har or he ko). Of course, extra ingredients at extra charge. No free lunches, OK?! Looks rather rundown, is it not? Don’t fret. You’ll notice a steady stream of customers in there. And rest assured you won’t be required to line up and carry your own plates! Location : Ah Leng Char Koay Teow stall @ Kafe Khoon Hiang, Jalan Dato Keramat, Penang. Here’s a MAP. Wow, char kway teow with mantis prawns? That's the first time I saw it. Wanna try it out! This is my favourite stall of ckt and of course I've blogged before. 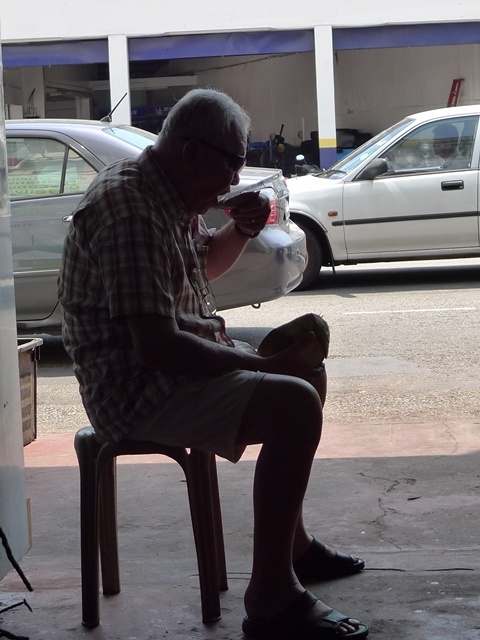 I guess the uncle is slurping some coconut meat? i spent 3 years in penang, but i too never knew of this place. i love food with creative twists, so that special ckt looks really appealing. used to have to drive up and down for work a lot too, so i can empathise with u. luckily these days i'm in the office 95 percent of the time. Tis CKT looks like it could induce a heart attack, yet so tempting! A deeeeelicious writeup, espesh when I am reading it from the middle east!!! 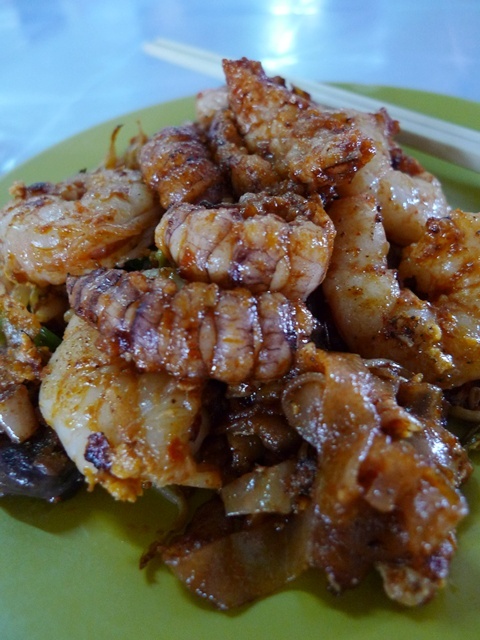 never tried CKT with mantis prawns…i want to try ……. we ate at Ah Leng too, just awesome delicious, prawn, prawn and mantis prawn! awesome I think! I dont have the chance to try the mantis prawn version yet. That's my fav CKT@penang… yum yum…really missed tat so much..
Wow.. the CKT looks so scrumptious! woah, kl-ipoh-penang. u've covered it all, dude! great! reading the signboard, i think ah leng means ah loong (dragon) in cantonese. still, that plate of ckt looks damn leng (pretty in canto)!! I am really upset with myself! I've read about this countless times yet have not been able to find time during my too-brief weekends in Pg to go! What kind of a Penang-lang am I?? A hopeless one! Wish I could invite you to my friends occasion home party as he (a Penang guy but settle here) luv to cook. His favourite is this CharKT with duck eggs & uses his own spices (paste). He his generous with prawns,porketc. I luv his KT which is true to Pg wok & charcoal stlye frying. He luv to invite few friends over occasionally. Wish he could open up a stall here & is sure a crowd HIT, but then he is the regional Mgr of a Bank. Hopefully he dont read my comments here. R u anyway near Antap Cafe? would like a plate of CKT with everything that you mentioned. char kway teow is always Yummy. but with mantis prawn?! a new try. haha. j2fkm, when did you come to penang? You travel a lot huh? ck lam : yeah, all thanks to you guys! allie : you've blogged before? ok, will try to find your post later and link it. TNG : KL cannot get the same right? 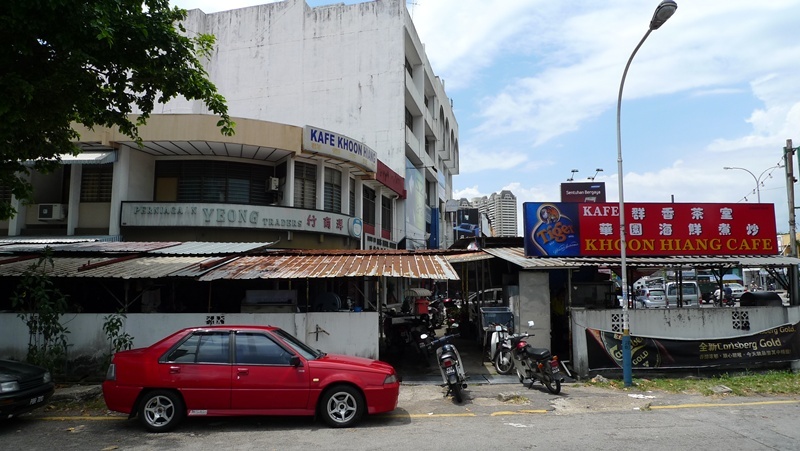 ditto in Ipoh. Sean : haha, forgot the mention. the ah leng does NOT refer to the word 'pretty' lah … my mistake for being a 'banana'. it's actually someone's name. Hazza : not to that extent lah … hehehe. Julian Si : still in Abu Dhabi?! wow … migrated there ah? go find yourself some meats! Simple Girl : additional bite, pair rather well IMO. BBO : good, with enough spiciness to tingle, not burn. Food paradise : oh, go try them before they increase the price again.hehehe … from the other reviews, it seems that previously the CKT's RM1 cheaper. iamthewitch : really? hahaha … rather hidden lah, thats why. xtine : beats those Macalister's and Selamat's, eh? Nic : yeah, its Ah Loong. probably Hokkien lang, my mum said. 550ml jar of faith : dont call yourself that… i'm sure you'll find the time. soon. antap cafe? Citrus there? why? foodbin : and more, right? LOTSA cockles too. mimid3vils : something diff ma … Pg's version also got crab meat char koay kak sometimes. ai wei : aiya, sometimes go to bed and sleep cannot solve matters geh … hehe. blog all nonsense out, feel much better. soo sean : this was last month lah, old post. travelling is the norm liao. nonstop. Fren! If u r nearby, I could invite you to his next outdoor party again loh. Hope you can feature his dish here. no worry, we are no crime lords. Hulk : crime lords?!! hahahah … how cool. I wouldnt mind! wmw : get them! get them! Haha this CKT post is still lugging in my draft. very nice ckt with wok hei. Mantis prawn is a good addition but some say the prawns are better coz it's more firm and juicy..goes well with the CKT. LOL! just near to my previous hostel near KDU! I never know there was such famous fried koay teow! Somemore with mantis prawn! WALAO!! Make me hungry just by looking at it! buzzingbee : prawns are forever the BEST accompaniment to a good plate of CKT. cockles a close second. the mantis prawns for extra oomph only. Jackson Foong : now you're no longer in Pg? if yes, GO FOR IT! LOl, now i am at Kampar,Perak ad! Should find chance to go back penang to try it with my ex-hostelmate there! Jackson : you're working in Kampar? throw me some recommendations lah! so I wont be like a lost lamb when I'm there! Nope! I am a student. I failed my A level at penang(nothint to brag of… LOL!). So now i am taking foundation at UTAR, Kampar. The food here are just so so… not much suite my taste. Except few of them. Such as the laksa. I also heard some legendary fried koay teow at the pasar at night. But i never have the chance to try them. Maybe i will try them 1 day n blog about it n u come try! K? penang really has good food..
Ipoh also a lot. So we’re easily duped into walloping good food then. i’m so shocked as i just ate this morning. I shocked not for the taste of the kuey teow, is the price. So small portion cost me RM5. If compare to the kuey teow ate near by penang hill this morning also, the kuey teow with same ingredients, even add on chinese sausage, not much difference in taste, onli RM3. Erm, there are some CKT costing almost RM10 per plate even …. guess people do pay for commercialization? Ganan, I’m from Penang. All these “famous” CKT stalls are there for “non-Penang” customers. Local guys will not fancy them.. There are plenty of good & reasonable price CKT here at Rm3 to 3.50. With the price diff. you can add plenty of prawns, sotong etc. Just go Jelutong Market, Macullum St flats opp Pos Office, They are cheap & good. Well, I eat at these stalls almost every other week. good with ‘wok hei’. What do you think? just love it, the prawn is so delicious and crunchy. i ate at Jalan Zoo, the new location at night time. Yeah, huge prawns. Super yummy. I have heard about this expensive plate of char kuay teow but never try it. There’s one Hokkien Mee stall at Old Green House where you add many kind of ‘liu’ too! I think for the ingredients inside, it’s pretty reasonable. Old Green House? Got address ah? It’s somewhere along Jalan Dato Keramat. An opinion from a Penangnite who stays in Singapore. Heard so much from Singaporean friends about this store, decided to try it out myself. Went to the store at Jalan Dato Kramat, Ah Leng’s son owns the store. To my opinion – OVER PRICED for the quality of CKT, $7 for normal, / $11.50 for special (price increased as mentioned in this website). I can’t deny the prawns were slightly larger in size, the mantis unfortunately were bad in taste, not fresh The noodles….average, if you pay one third of the price (approx. RM3/4.) you can get same quality or even better CKT accross the island! I had more than 100 plates of CKT since young, all around Penang, from stores away from city, market, residential areas….So conclusion – the quality of CKT in this store, frankly, nothing special, not worth trying and spend this amount, you can get better, it is popular and attracts many tourists because of online publicities. Had 3 plates rm 11.50 +0.50 duck egg, not worth going not so great as publish by bloger just normal CKT. You can get some better in the island, only special is has same big prawn like lorong selamat. I rather paid rm 20 for 10 BIG prawn big ckt at lorong selamat. Full address please! Can’t find the location ! Typical of the Galaxy line of Samsung phones its screen is pretty darn vivid; thanks to 1080p HD. look very clear and the colors are vibrant. Is it open during hari raya puasa? thx. I am so hungry now. Thanks for sharing the content and pictures.